In the southern part of the conservatory, a small rectangular portion was set aside to exhibit Coastal Fynbos and Strandveld vegetation, which is found only in the low-lying, coastal regions of the Western Cape. This vegetation is threatened by urbanisation, agriculture and the spread of invasive alien plants. The climate is windy, with cool rainy winters and hot, dry summers. Fynbos vegetation consists of a mix of shrubby plants, reed-like perennials called restios and bulbous plants, and is adapted to nutrient-poor soil, strong winds and summer drought and occasional fire. 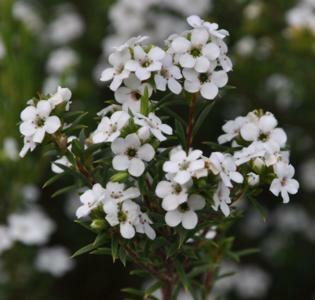 Many of the shrubs bear small leaves, which is how it earned its Afrikaans vernacular name fynbos, from the Dutch fijn and bosch meaning fine bush. Strandveld vegetation falls under the umbrella of Fynbos. Many of the plants are endemic and unique to the southwestern Cape, one of the world’s 6 floral kingdoms. Many coastal fynbos species have already become extinct, others survive in small numbers on roadsides, under powerlines and in a few small reserves. Fynbos is subject to occasional fire and the plants are well adapted to survive them. While too frequent fires harm the vegetation by not allowing the seed bank to develop, without the occasional ‘fire pruning’ every 8 to 15 years or so, the vegetation deteriorates. In cultivation this can be simulated by pruning and the smoke treating the seeds, a process enhancing their germination. Soils in the Fynbos region are usually sandy, acidic and low in nutrients and minerals. Some of the prominent families include the Cape reeds or restios (Restionaceae), Protea family (Proteaceae), Erica family (Ericaceae), Iris family (Iridaceae), Buchus (Rutaceae), Stilbe and Retzia family (Retziaceae), Milkwort family (Polygalaceae) and Vygie family (Mesembryanthemaceae). Typical plants in this section of the conservatory include; Cape may or white confetti bush (Coleonema album), Aloe distans, whorled heath (Erica verticillata) which is extinct in the wild, Euphorbia marlothiana and E. muirii, pig’s ear (Cotyledon orbiculata), which is common throughout South Africa, Strandveld sage (Salvia lanceolata) with its unusual orange-brown flowers. Also to be found in this bed are dune spinach or kinkelbos (Tetragonia decumbens) and trailing dune spinach (T. fruticosa) and dronkbessie (Solanum africanum) which is a scrambler. Also here is porcupine potato (Kedrostis nana) and Maurocenia frangula, a sturdy shrub bearing reddish foliage, soon turning to a dark green. Pelargoniums that can be seen here include; rose-scented pelargonium (Pelargonium capitatum), camphor pelargonium (P. betulinum) and hooded pelargonium (P. cucullatum) and the carpet geranium (Geranium incanum). .
Go to our plant information website www.PlantZAfrica.com to find out more about the plants.